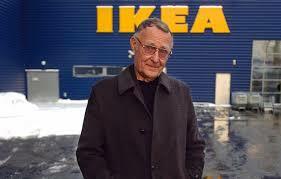 Founder of furniture chain Ikea; the pioneer of flat-pack furniture -- via the BBC. A crazy genius with a penchant for fascism, the thrifty and obsessive Kamprad wanted to create low-cost, build-it-yourself furniture for the masses. He succeeded. Today millions use his products -- although complaining bitterly on how to put together and maintain his flimsy work is a comic subgenre in itself.